Zeng Fanzhi’s painting style is intensely expressionistic, as his different series of works depict the psychological states of modern urban dwellers. Oversized hands, muscular flesh and blank stares are characteristics of his aesthetics and convey the tortured mental state of his protagonists. 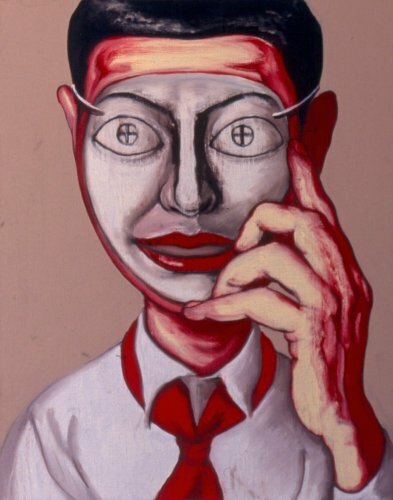 In his early works, the Hospital series, the inner tension of the human psyche and the absence of relatedness, or the absence of compassion was illustrated with raw violence: busy canvases notably show doctors, embodying bureaucracy, sitting coldly next to the pain and misery of patients. In the Mask series the artist moved into focusing on the individual and his inner conflicts. The mask is reminiscent of carnival and clowns, an allusion to vanity and to the consciousness of putting on a show and repressing one’s self-expression in public life, has a haunting and disturbing power. The artist has also portrayed other artists, icons of the past century, such as Andy Warhol or Francis Bacon, whom he admires. 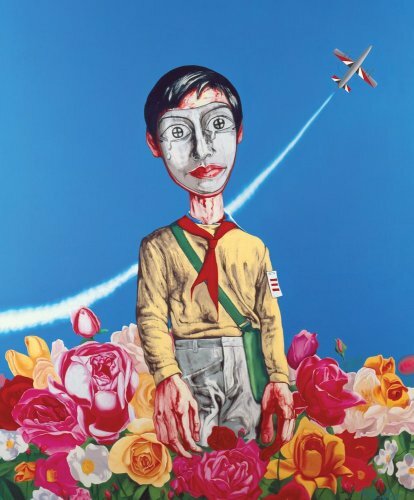 In later series, Zeng Fanzhi shifted to an investigation of human interactions with nature. His recent landscape paintings, notably by the shore, both suggest a notion of permanent escape. This series is sometimes inhabited by a human presence, sometimes bare of it and sometimes focuses on an animal. The stylistic evolution of these works is ‘Abstract Expressionism’. Throughout different series, the solemn is retained, a characteristic dear to the artist who meditates and needs complete calm to create but whose mind is never at rest.